(1965) Where Am I Going? "Where Am I Going?" 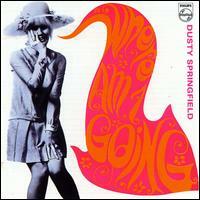 is the third studio album by singer Dusty Springfield, released on Philips Records in the UK in 1967. By now, firmly established as one of the most popular singers in Britain, with several hits in America as well, Springfield ventured into more varying styles than before, and recorded a wide variety of material for this album. Rather than the straightforward pop of "A Girl Called Dusty" or the mix of pop and soul of "Ev'rything's Coming Up Dusty", Springfield recorded a variety of styles from jazz to soul, to pop and even show tunes (the standout title track, from the musical Sweet Charity). While not the success that her previous two albums were, Where Am I Going? was praised by fans and critics alike for showing a mature and sophisticated sensibility, despite the many different styles of music. In the United States, the album was released in a quite altered form as "The Look of Love", titled after a successful Springfield recording originally only released as a single B-side in Britain. Also included were two other singles — "Give Me Time", a U.K. and United States hit, and "What's It Gonna Be", a United States hit — not included on Where Am I Going?. The Look of Love also contained the UK single B-side "Small Town Girl", not on "Where Am I Going?". UK Philips BL. 7820 mono (1967). Album produced by Johnny Franz and Dusty Springfield. The albums original laminated, flipback cover, is in excellent condition, displaying only minimal signs of wear.